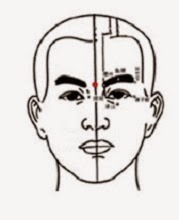 In Traditional Chinese Medicine, stimulating acupressure points, or acupoints, can clear blockages, correct imbalances of Yin and Yang energy and promote self-healing of the body. Further benefits of acupressure range from relaxation to removing toxins to improving certain chronic conditions, such as high blood pressure and diabetes. 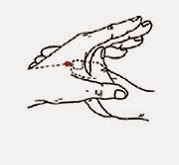 Many acupoints are easy to locate and remember, and basic techniques only involve applying pressure by pressing or kneading. With this do-it-yourself guide, you can learn how to relieve many types of discomfort and have more control over your well being. • Press and knead on the Yin Tang acupoint using the fleshy part of either middle finger for 2- 3 minutes. 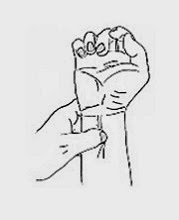 Then using your thumb and index finger, lightly pinch this acupoint for about 1 minute. • This massage can be done 3 times a day or whenever needed. 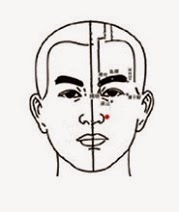 • Using the tips of both index fingers, press on the Ying Xiang acupoint, about 1 minute each time. Then in an upwards – downwards direction, follow the outline of your laugh lines and the sides of the nose using both thumbs. • This massage can be done 2 – 3 times per day or whenever needed, about 1 minute each time. Drink warm water after each massage. Benefits: Located near the carotid sinus, hence it is said to regulate blood pressure. Stimulating this area helps to slow down the heart rate and lower blood pressure. 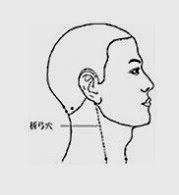 • Press your thumb on the Yi Feng acupoint, which is behind the ear, pushing and pressing towards the indentation above the clavicle for 100 times. Push the left side before the right side. Do not push both sides at the same time. • You should have the feeling of hardness and swelling. The style of massage should be soft and uniform. Location: In the middle of the wrist, about two finger widths below the palm. • Use your left thumb to press on the right Nei Guan acupoint, with the thumbnail placed laterally to the two tendons, press 20 times. Then, knead in circular motion for 2 minutes. Repeat with the right thumb in the left Nei Guan acupoint, 2 times daily. • You can also wear a wristband with a bump that will press into Nei Guan acupoint when positioned properly. 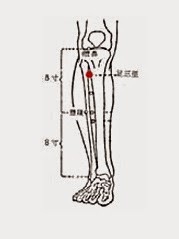 You should feel soreness, numbness or expanded stimulated feeling towards the middle finger or to the elbow when stimulating the Nei Guan acupoint. Location: On the outer calf, about four finger widths under the knee bone. Press with thumb/tap with object until soreness and numbness is felt. Do this massage for 5 minutes a day. • Press and release 30 times per minute for each side. You should press the He Gu acupoint until soreness or numbness is felt. • For constipation: press and knead for 3 minutes, then rub the stomach in a clockwise direction. • Strong stimulation is not suitable for weak people. Not recommended for pregnant women.